Let’s talk about the fabric first. 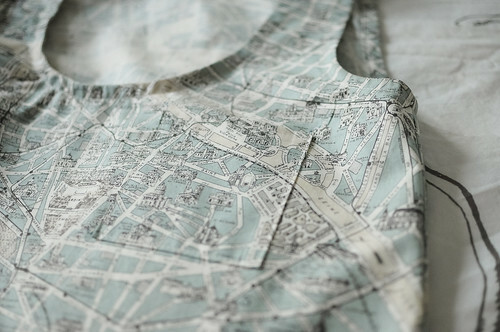 This Paris Map fabric is incredible. It’s the kind of fabric that I could use over and over again and never get tired of it. It’s the kind of fabric that only lasted in the shop for about 24 hours before all 3 bolts of it were gone. It’s the kind of fabric that you want to hoard forever and never not have it in your life. Again, I have to say that I super proud of my pattern matching on the pocket. (See my first Wiksten Tank here) You can barely see that there is a pocket! 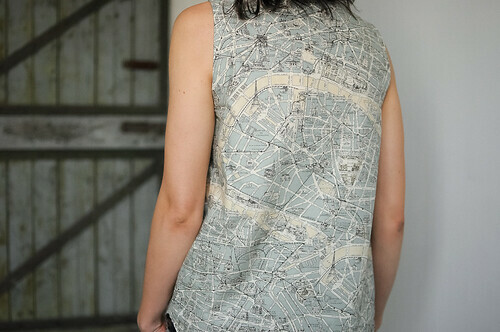 I still have at least a metre left of these Paris Maps (plus every little bit of scrap from cutting out the tank) and the rest will likely go into some future quilts and definitely into my Blue & White Farmer’s Wife Sampler. Our dear Kristiann, has recently launched her own line of pdf sewing patterns. Her company is called, ‘Victory Patterns‘ and I know you’re going to fall in love with her designs. I have my eye on the Hazel dress with those sweet front ties. Have you seen the online magazine, Covet Garden? It is SO good. Each issue features a different house in Toronto and this issue features Arounna & John’s home from ‘Bookhou‘! The Frosted Pumpkin Stitchery is starting a Dessert of the Month club. Each month you get a new adorable dessert cross stitch pdf pattern emailed to you. the workroom will be working with the Pumpkins to create Cosmo floss sets every two months that will contain all the colours you will need to work on your desserts. We sold out really quickly on the January/February sets yesterday, but more floss is on the way. Let me know if you’d like to buy a set when they are back in stock! That’s a lovely project Karyn! Simple lines for a wonderful fabric. Your map tank is perfection K! When I see gorgeous garments like this, I want to run down to my machine and sew my own clothes. 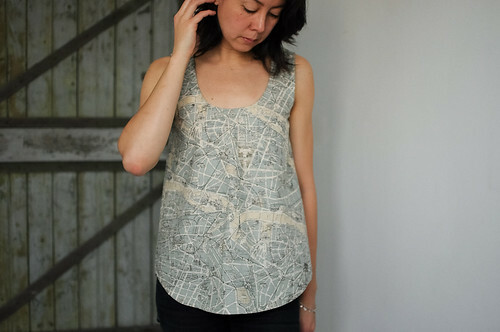 So many great links in this post – love your tank, love the Hazel pattern and may NEED it! Thanks so much! Congratulations to Kristiann – so brave! WOW! This is beautiful and yet another confirmation that I have to get this pattern next time she releases another batch. Very cute! What a great use of fabric! Love it! Oh my I love Wiksten so much and have yet to buy a pattern and make a top for myself. 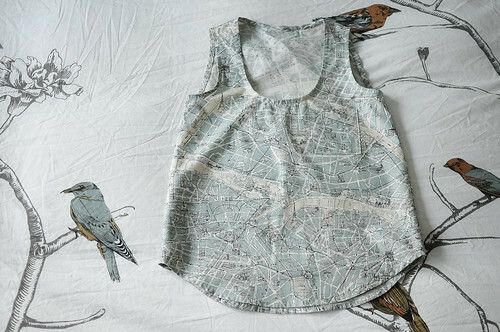 But you’ve inspired me to get moving, I love that map fabric and your top is beautiful! I love Wiksten patterns.. I have this one and the tova top but have not actually got around to making them yet.. I’ll add that to my list of things to do in 2012! What a perfect use for that fabric! I just made the Wiksten tank for the first time last night and love love love that pattern! Such a quick and satisfying project. Very excited for those Victory patterns too. Beautiful designs! And as always, Bookhou rocks my handmade world! It was great seeing them in that feature. Wow, awesome fabric! you always pick out the best fabrics for garments! Can’t wait to see your tova top. That is such a great top. The fabric amazing! Have you picked a day to start the farmers wife quilt along yet? I can’t wait to get started on this one. It’s going to be so much fun 🙂 I hope your having a great day! I hope she’s still selling them. LOVE that fabric!! and beautiful tank Karyn. Hi Lia, that’s the right print, but i used a different colourway that is darker! the background is aqua with grey street lines. Hi Lia – this is a couple of months since your comment, but I just made the Wiksten Tank in the dress style, and I made it maternity-friendly by adding 3 inches to the front and gathering (8 inches down to 5 inches) in the belly area. I think it worked out fine, I’m 23 weeks and the dress fits great with room to grow! The only weird thing is that the back of the neck seems to go too high or gape a bit – has anyone else had this issue? I’m assuming it depends on our body shapes. Owning the hem I see! I have two more winter tanks under construction and two outstanding Christmas gifts. Repetition will bring mastery to be sure! Beautiful garment, masterful pattern matching, fantastic links roundup! I have always shied away from using quilting fabric for garments (too worried about how it will drape on my body, I guess, though it’s an un-reflected-on bias and not a matter of principle… I like either flowy fabric like voile, or heavier fabric like denims or suitings for more structured garments). But your tank is really inspiring and doesn’t look stiff or undrapey at all! How does it feel to wear? so beautiful–I’m definitely copying this! I love this… like the poster above, I am totally copying this and getting the fabric. So lovely! p.s. your shop seems like a wonderful idea! WOAH! This is beautiful! I bought 1/2m of the same fabric from The Eternal Maker ages ago when it first came in and it’s been stuffed in my stash box ever since! I’m now wishing I’d bought more so I could make this tank..! Aah well, I’ll have to find a suitable alternative! I do have a fat quarter each of two different colour ways but I think it needs a solid colour. hmmm!